You are here: Home / Recipes / 4 Simple Steps to Garlicky Goodness! 4 Simple Steps to Garlicky Goodness! The other day I went to Macaroni Grill because I was dying for their create your own pasta dish with the Roasted Garlic and Parmesan sauce. If you haven’t tried it yet, it is absolutely divine! Into my pasta I also asked them to throw in some extra roasted garlic cloves. Yes, I remembered to bring my breath mints that afternoon! Anyhow, I came home and decided that roasted garlic should be put into just about everything and decided to figure out exactly how to make it at home. Garlic has so many health benefits, too. It is a natural antibiotic, has strong antioxidant properties and it may help keep your cholesterol in check, too. Here is a very simple method of roasting garlic…do it in bulk and add to pasta sauces, spread on slices of crusty bread or brush onto chicken before baking! Step 1: The Peeling! 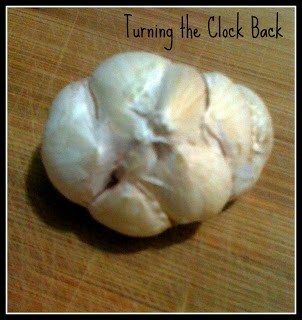 Peel away the outer layers of the garlic bulb skin but leave the skins of the individual cloves intact. Do not remove the cloves from the base of the bulb. Step 2: The slicing! 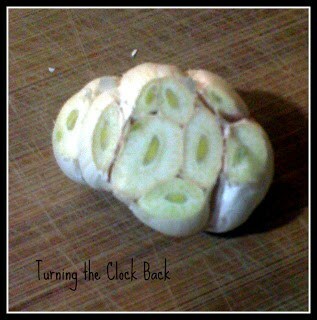 Using a sharp knife, cut off about a 1/4 inch of the top of cloves, exposing the individual cloves of garlic. Step 3: The Baking! Place the garlic heads into a muffin tin and drizzle the tops with a few teaspoons of good olive oil. Make sure it is well covered. 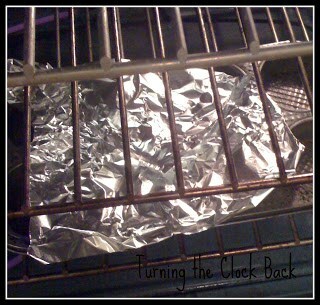 Cover the garlic with aluminum foil and bake at 400°F for 30-35 minutes. The cloves should feel soft when pressed. Step 4: The Eating! Allow the garlic to cool a little bit so you can handle it easily. 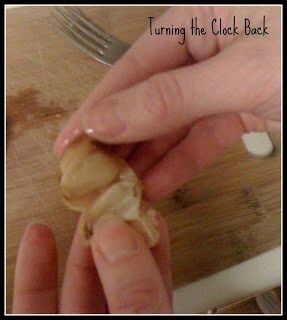 Use a small fork or your fingers to squeeze or pull the garlic cloves out of their skins. Either eat as is or use in a sauce or on bread! Roasting takes the ‘bite’ out of it and the flavor is more mellow and the texture of the clove is amazingly creamy and smooth. YUM! Now, I just have to find a good Roasted Garlic and Parmesan Sauce like the one at Macaroni Grill so I can indulge my craving whenever I want! Anyone have one they want to share? I am obsessed with garlic but it has never occurred to me to roast the cloves and eat them straight! This would be divine in pasta. I love recipes with garlic. I've never eaten the roasted garlic straight but I do use it in recipes. Wow..this is cool. I never thought of eating it like that! And had no idea how to prepare it either. THANKS! I have never cooked with actual garlic before...I may just try this and see how it goes! 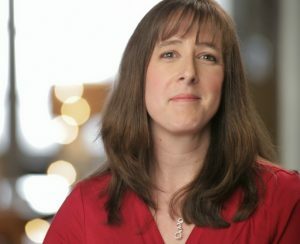 My aunt used to throw two whole pods of garlic into her spaghetti sauce. Once it was cooked we enjoyed the cooked garlic straight along with the spaghetti and meatballs. I love roasted garlic but never thought to roast them in muffin tins. 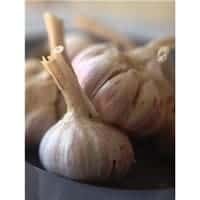 I also hear garlic can be roasted and frozen which would make easy to use in cooking other dishes. That would be good when garlic is on sale. They could be frozen on a baking sheet and then placed in plastic bags. That way they would stay separate. Thanks for making me think outside the box. glad to help! I love roasted garlic since it has such a mellow flavor once it is done! Oh, one other question. Why do most people cut the top off of the garlic? I always cooked mine whole without removing the top quarter of the garlic pod. They cook just fine uncut. I always saw that as a waste of good garlic. Does anyone know why the tops are cut off? Maybe I'm missing something. I don't know why anyone would need to do that either! I just peel and mince!